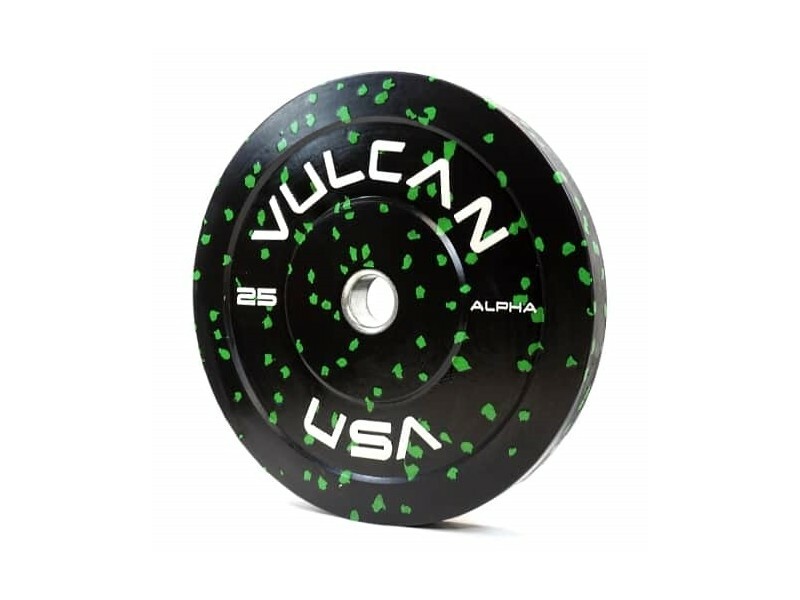 >> If any sizes you need are marked above as out of stock, we recommend you do a backorder directly from Vulcan Strength and your order will ship within a month. 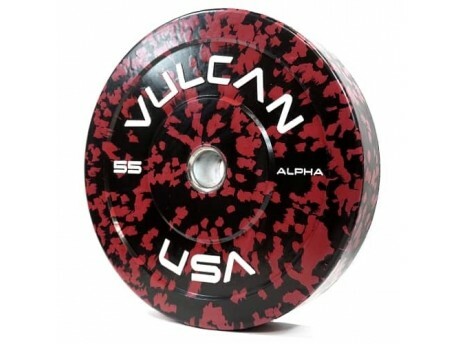 Price includes two bumpers of specified weight. These are only sold in pairs. 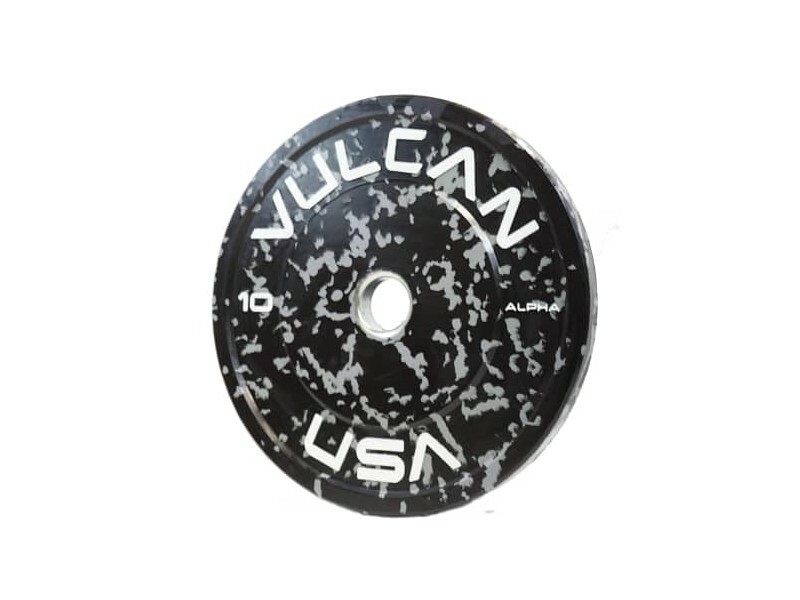 Most other brands of bumper plates we sell are priced individually. 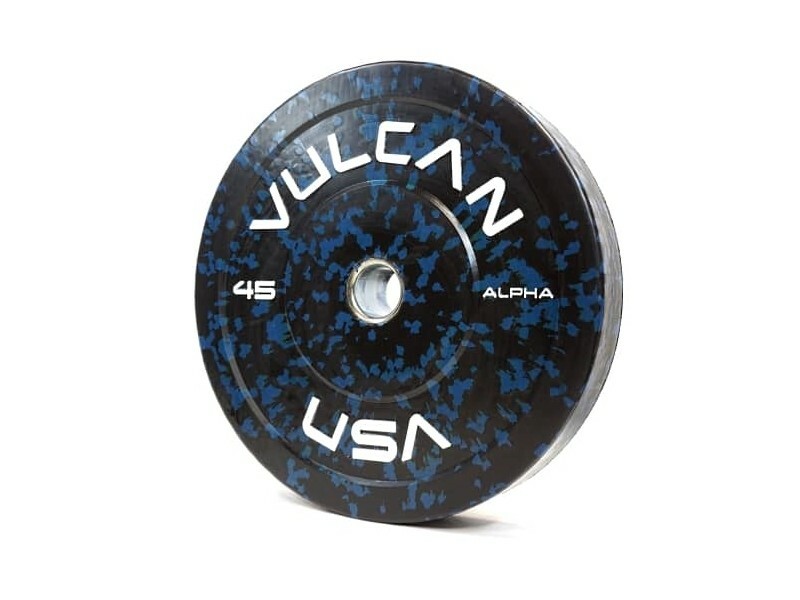 Vulcan Strength's Alpha bumpers are unlike any other bumper plates on the market. Naysayers said you couldn't combine these features into one bumper. Low bounce but low noise? Thin profile bult extremely durable? Low odor? Vulcan did it. These are the future. The unique virgin rubber formula makes for a bumper that has a dead-blow bounce like virgin rubber bumpers. Not only do these have a low bounce, they also have low noise. 25% less noise when dropped from overhead as measured by a decibel meter. Dropping bumpers gets LOUD, especially in a home garage or in a group environment. These are the best bumpers to mitigate the noise, save your ears, and appease your neighbors. These bumpers hold up so well that they can be used on bare concrete. You can't say that about most other bumpers. Others will wear out quicker on concrete or will start pulverizing the concrete. Recycled rubber is stinky. These are virgin rubber, with only a hint of odor, and it isn't an issue when used in a garage. Colored flec design matching the IWF color scheme gives you easy identification for sizes. Fit (5) 45lb bumpers on a bar to load it to 495 lbs! 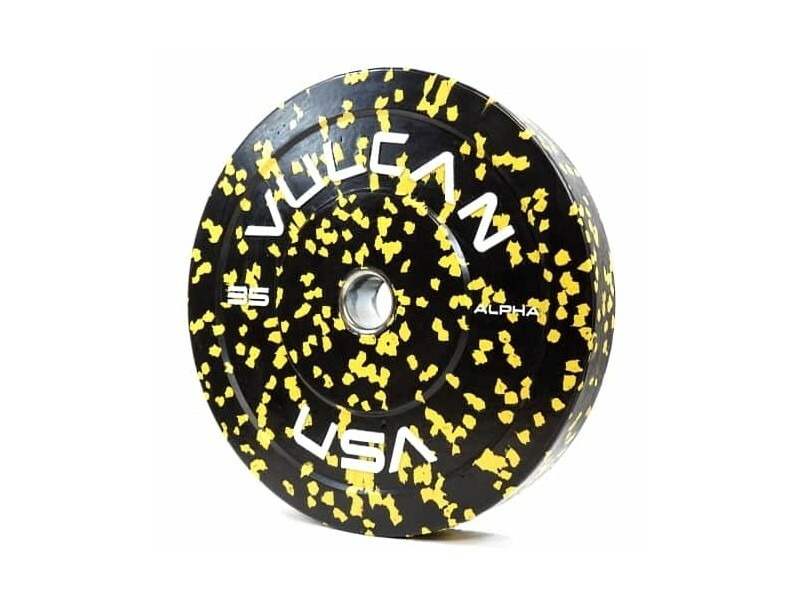 These are more dense than traditional training bumpers, and until these came along you couldn't go so high without using extremely expensive steel-core competition bumpers. The exact amount you can load on your bar will depend on its sleeve length. See bumper thicknesses below. Other brands of 10lb bumpers are so thin or weak that they "taco" and break when dropped alone on a bar. These are made a little smaller diameter so that they are also thicker, for a larger impact surface area. Use a pair of 10s as the only bumpers on the bar, no problem. 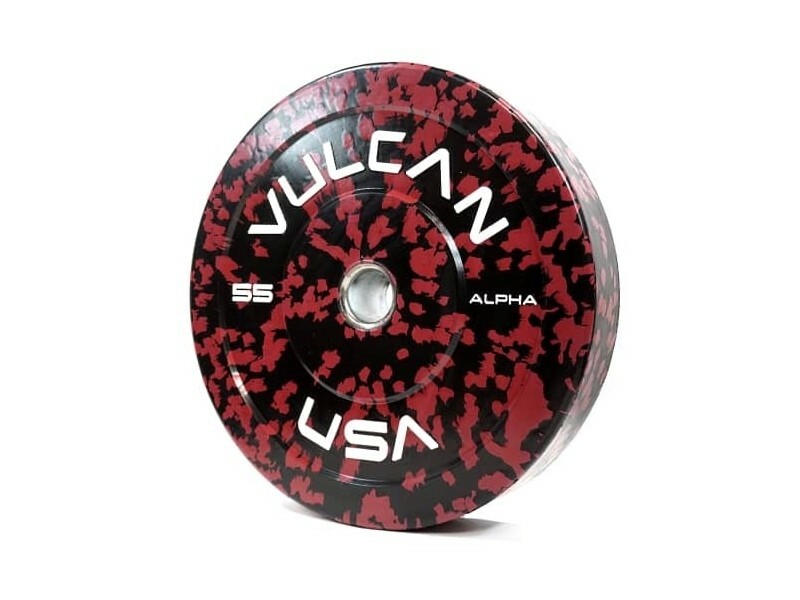 Vulcan Strength stands behind these bumpers. The 55lb, 45lb and 35lb are warrantied for 3 years. The 25lb for 18 months, and the 10lb for 1 year.